David Bass is a native Texan, born and raised in the Dallas-Fort Worth area. He majored in English with a Creative Writing specialization at Southern Methodist University. Following his graduation, David moved to Milan, Italy where he served as a church planting intern for two years. David attended Denver Seminary from 2010 to 2014, graduating with a Master of Divinity degree with a concentration in Intercultural Ministry. Lauren Brewer Bass is a Fort Worth, Texas native. She attended Hardin-Simmons University and Logsdon Seminary in Abilene, Texas where she received an undergraduate degree in Spanish and Religion and a Master of Divinity degree with a concentration in Spiritual Care. Lauren is also a writer. Her first book, Five Hundred Miles: Reflections on Calling & Pilgrimage, was published in 2015. Cambodia, located in Southeast Asia, has a population of approximately 15 million. The capital and largest city is Phnom Penh, a city of about 2 million people. About 80% of Cambodians live rurally, many as rice farmers. Theravada Buddhism is the religion of 95% of population. About 2 million Cambodians died in the genocide during the bloody reign of the Communist Khmer Rouge from 1975 to 1979. Cambodia has had peace since 1991 as a constitutional monarchy with protection of religious freedoms. In 2005 the country joined the World Trade Organization and opened markets to free trade. The country faces numerous challenges, including widespread poverty, corruption, lack of political freedoms, low human development and a high rate of hunger. Cambodia is also a growing tourist destination with over 4 million people visiting its temples and beaches each year. Cambodia is in the tropical zone, just 10 to 13 degrees north of the equator. It is warm to hot year round, and the climate is dominated by the annual monsoon cycle with its alternating wet and dry seasons. The southwest monsoon brings the rainy season from mid-May to early October. The Cooperative Baptist Fellowship is a fellowship of Baptist Christians and churches who share a passion for the Great Commission of Jesus Christ and a commitment to Baptist principles of faith and practice. 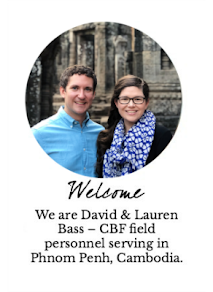 For more than 25 years, CBF has been driven by its mission to serve Christians and churches as they discover and fulfill their God-given mission. CBF’s vision is to be a national and global community bearing witness to the gospel in partnership with Christians across the nation and around the world. Based in Atlanta, CBF partners with 15 theological schools, 18 autonomous state and regional organizations, approximately 1,800 affiliated churches, and more than 150 ministry organizations worldwide. Empowered by the Holy Spirit, CBF Global Missions seeks to cultivate beloved community, bear witness to Jesus Christ and seek transformational development among people and places otherwise forgotten and forsaken. CBF Field personnel serve alongside congregations within three primary contexts: global poverty, global migration and the global church.